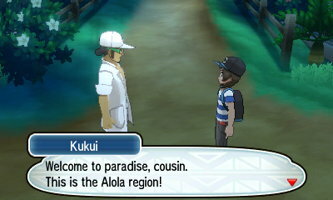 After selecting a language, Professor Kukui will introduce you to the Alolan region. 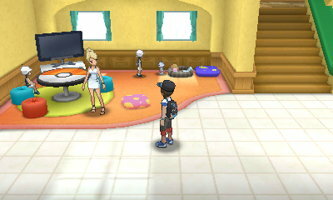 You'll be able to select a gender, skin tone, and name your trainer. Afterwards, your mother prompts you to help her get moved in. A cutscene will play introducing a girl running from some people in uniform. 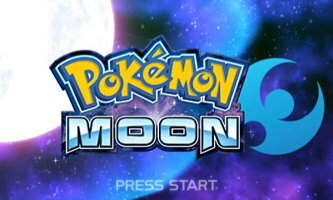 After a title screen, you'll be brought back to the present and be awoken by a Meowth. After speaking with your mother, you'll be visited again by Professor Kukui. After talking to the professor, go back upstairs to your room and check out the moving boxes. 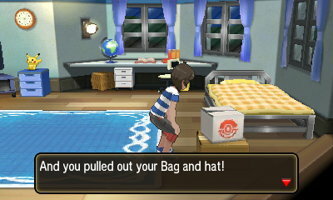 You'll get a hat and your bag. Head left after exiting your house and the professor will then lead you north to Iki Town to meet the Kahuna. You can speak to the trainers along this route to learn some useful tips about controls (hold B to run). After arriving in town, the professor tells you to find the Kahuna. Head north and left and you'll catch a glimpse of that mysterious girl from the opening cutscene. Follow her north onto Mahalo Trail. Follow this trail to the north for a while. 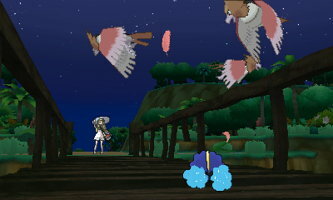 A cutscene will soon play where the girl releases a Pokemon and it gets attacked by some Spearow. The girl will then ask for your help. Approach the distressed Pokemon and a cutscene will begin. A mysterious Pokemon will come to your rescue and the girl will give you the Sparkling Stone. Head back south and the next cutscene will bring you back to Iki Town. 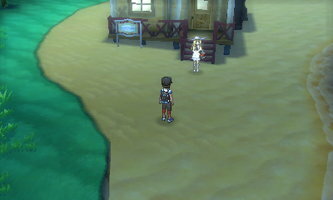 The mysterious girl turns out to be the professor's assistant, Lillie. The Pokemon you saw earlier was Tapu Koko, the island's guardian deity. 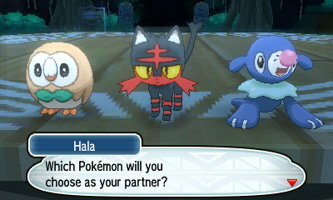 Kahuna Hala will show up and let you choose between one of three starter Pokemon. Your options are Rowlet (Grass-type), Litten (Fire-type), and Popplio (Water-type). After you choose your starter, Professor Kukui will give you the Pokédex and your Trainer Passport. Head south towards your home town to begin your first Pokemon battle against your rival, Hau. Unlike previous Pokemon games, he'll pick whichever starter Pokemon you have the type advantage against. You should be able to quickly take him out using STAB moves. Kahuna Hala will then take your Sparkling Stone. After some cutscenes you'll arrive back at your mom's house. After some dialogue with her, the professor will once again arrive at your door. Follow him to the right of your house onto Route 1. He'll show you how to catch a wild Pokémon. He'll give you 10 Poké Balls and 5 Potions. After the dialogue, head north towards Iki Town. You can now battle and capture any wild Pokemon that you'd like. Pick up a Potion from an Item Ball near the second patch of grass. Just north of this you'll encounter your first Pokémon trainer. Defeat him and continue north. There will be another trainer here and a Poké Ball in an Item Ball to the north near another patch of grass. There will be an Antidote in an Item Ball behind a fence on the left side of the trail. Continue left and north, picking up another Potion to the right and battling the trainer if you'd like. There's a Paralyze Heal on the left of the trail right before the entrance to town. Continue north to Iki Town. The residents of Iki Town are celebrating for a festival. 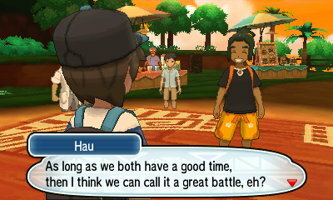 Kahuna Hala will heal your Pokemon and then Hau will challenge you to a second battle. He'll have a Pichu in addition to his starter Pokemon, but you should still be able to easily defeat him. After the battle, Kahuna Hala will give you a Z-Ring. The rest of the cutscene introduces Island Challenges, Alola's replacement for gym leaders. You'll then then find yourself back home and your Pokemon will be healed. Lille will then lead you to Kukui's lab to the south. Continue south along this route, you can battle the two trainers on this route and pick up an Awakening from an Item Ball if you'd like. Head into the lab. The professor will upgrade your Pokedex to the Rotom Dex. He'll also give you an Island Challenge Amulet. Exit the lab and head back north towards your home, and then go left from there. 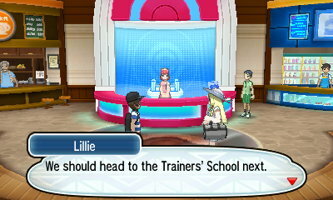 After an introduction to Pokemon Centers from Lillie, continue left to the Trainer's School. The professor is waiting for you here and will give you the Exp. Share. You can pick up a Potion in an item ball on the left side of the school grounds by the palm trees. Head through the gate to the left and battle the trainer. Defeat his Metapod and pick up the Antidote and Paralyze Heal to the south. Head to the right side of the building, picking up the Potion along the way. 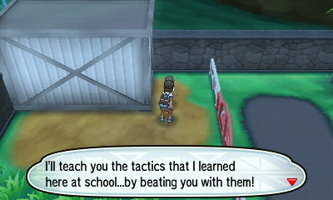 Defeat the trainer on this side of the building. Enter the building and speak to the adult watching some younger children to the left to get the Quick Claw. 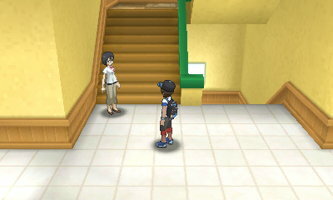 Speak to the young trainer to the right of the staircase to battle her. Defeat her Bonsly and head back outside. Speak to the male trainer out here to battle him. He has a Grimer that can poison your Pokemon (Antidotes are useful) but shouldn't give you too much trouble. He'll give you TM01 - Work Up after you beat him. You may want to go to the Pokemon Center and heal up at this point. Head back inside the school and go up the stairs. You can get a Potion from a kid in the left-most classroom. Speak to the teacher near the stairs to battle her. 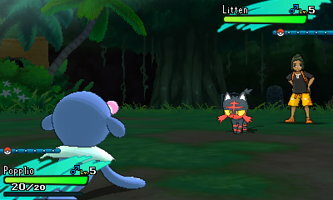 Unless your starter is Litten, her Magnemite will likely give you trouble. It's recommended that your Pokemon are in the 10-12 level range before you attempt battling her. She'll give you 5 Great Balls as a reward for defeating her. 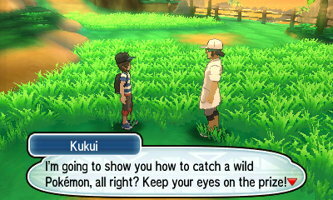 You'll then be introduced to Trial Captain Ilima. 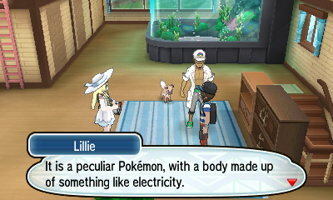 Lillie will then lead you into the city. Pet the Tauros blocking your path and then head left into Hau'Oli City.